Call or visit us to see what we have available in new or used trailers. If a week or two in Northwoods paradise isn't enough for you, we offer trailer parking on a year-round basis. We have both waterfront and off-water sites. 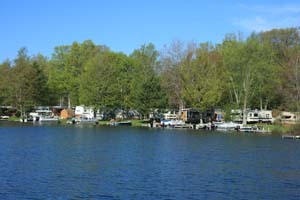 Dock space is available and a private boat ramp is located in the campground. 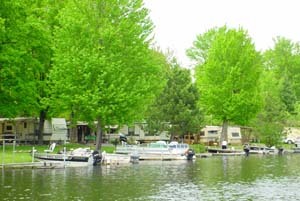 The campground provides individual electric, water, laundry facilities, bath house, private boat launch, fish cleaning facilities, dump station and gasoline for sale on the grounds. Some of the sites have direct sewer hookups. Overnight trailer parking is available on a limited basis.